International food connoisseur Andrew Zimmern considers Filipino food as the next big thing in culinary arts. He couldn’t have said it better. Our cuisine, often thrown into the sidelines in the global culinary scene, is undoubtedly one of the most unique ones in the world. Snippets of our nation’s history and culture can be experienced in every bite. Considering that the Philippines is an archipelago surrounded by expansive seas, it is no wonder that fishing is a major economic driver and a way of life for many of our countrymen. 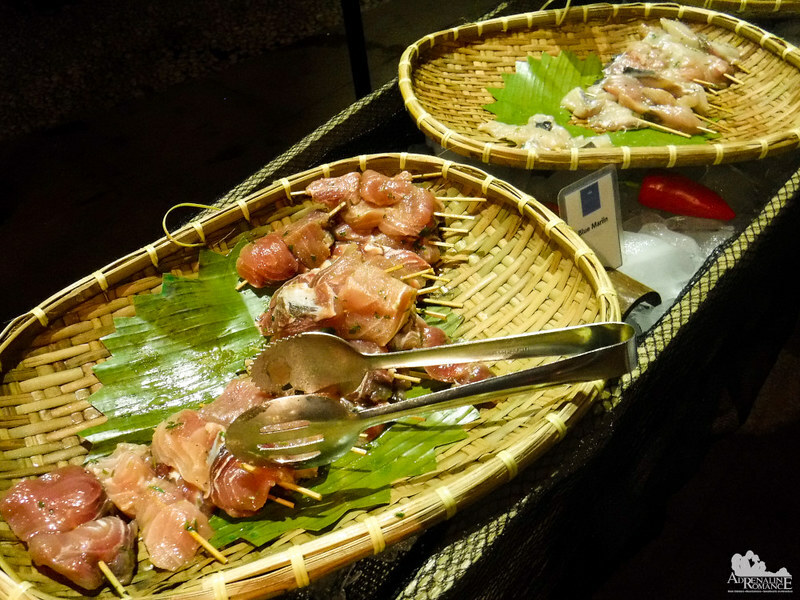 Thus on our first night, we had the honor of joining their Fishing Village buffet, a dinner to honor our fishermen and to appreciate the bounty of our seas. By the time we arrived at the Aplaya Restaurant at the north end of the resort, the place was already bustling with activity. Diners were enjoying their meals, and the staff were busy taking and serving orders. Like a healthy reef with playful fish, Aplaya Restaurant was a lively place. Steamers filled with seafood stews, soups, and other dishes occupy the central bar. The Fishing Village is a large buffet of the bounties of the sea. 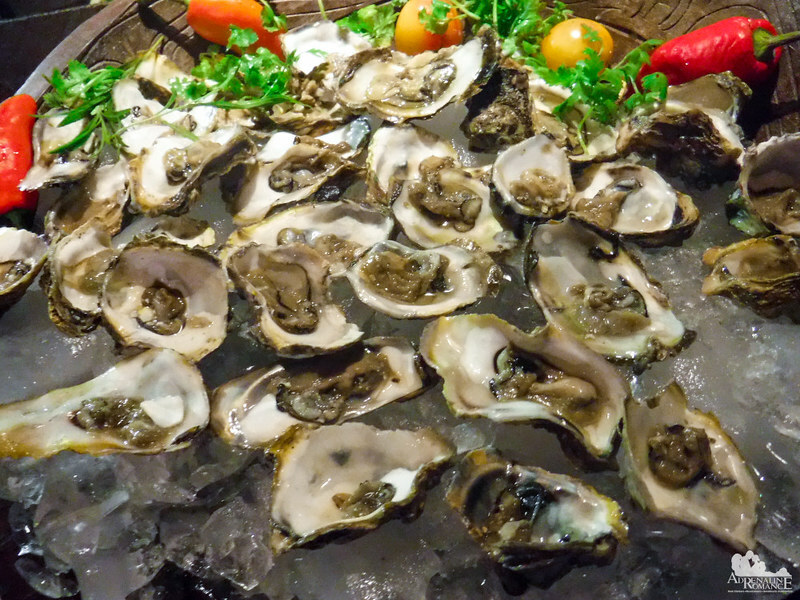 We first went to one of our favorite but rarely eaten treats—fresh oysters! Oysters are abundant in iron, calcium, zinc, and selenium. They are also rich in protein and vitamins A and B12. Of course, they are traditionally considered as an aphrodisiac (due to its high zinc content), but do you know they contain just about 110 kilocalories? Yes, they’re sexual and non-fattening. It’s the best of both worlds! 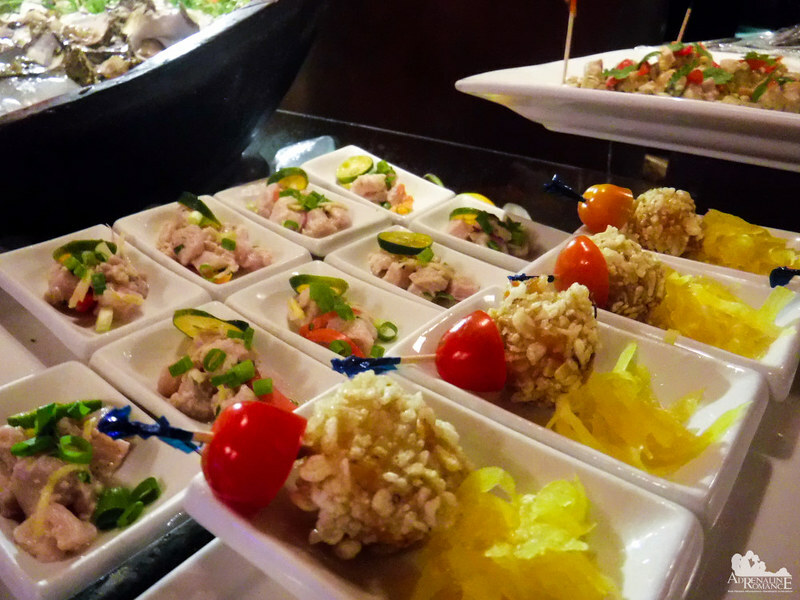 For appetizers, kinilaw (raw fish soaked in vinegar and topped with onion, chili, and kalamansi) are displayed in small servings. Kinilaw is traditionally eaten as a side dish or a pulutan (finger-food) to accompany alcoholic drinks. Skewered breaded fish fillets with cherry tomatoes served with achara (pickled papaya) also line up the appetizer table. The grilled fish are a must. Simply choose which fresh local fish you want for your dinner. Personally, we recommend those rabbitfish heads. Bigger, softer, and more expensive cuts such as tuna, salmon, and jackfish are skewered and available. After choosing your cuts, hand them over to this smiling and friendly chef, who cook the meats to perfection. 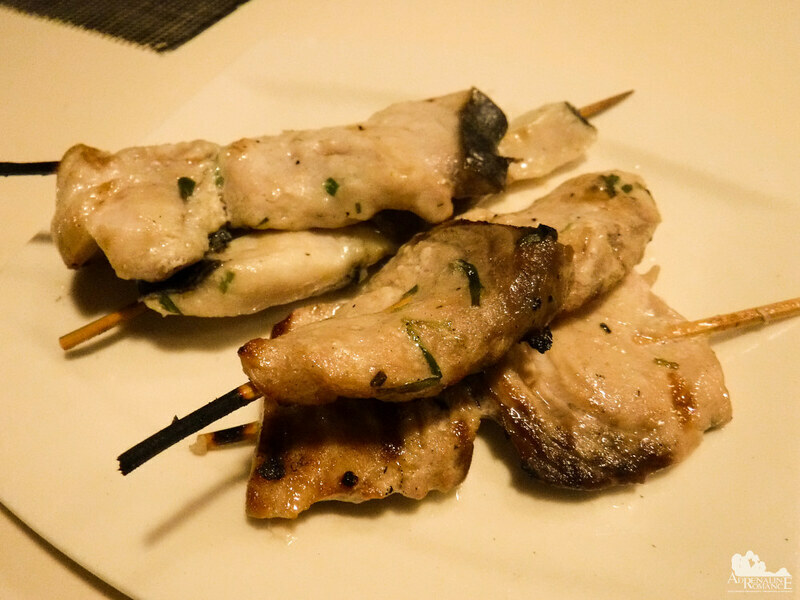 The fish are grilled in a charcoal-fired, rather than gas-fired griller, reflecting the traditional way of Filipinos in preparing their meals. 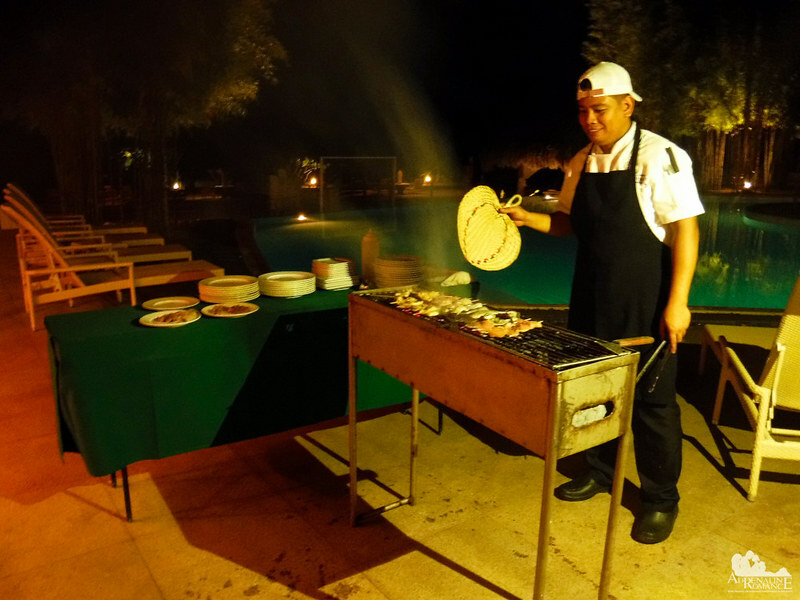 Once your grilled fish is done, the restaurant staff delivers your steaming, juicy, delicious fish to your table. Yummy! We are not sure how they can memorize which selections belong to whom, but they can do it with ease. Now that’s photographic memory. 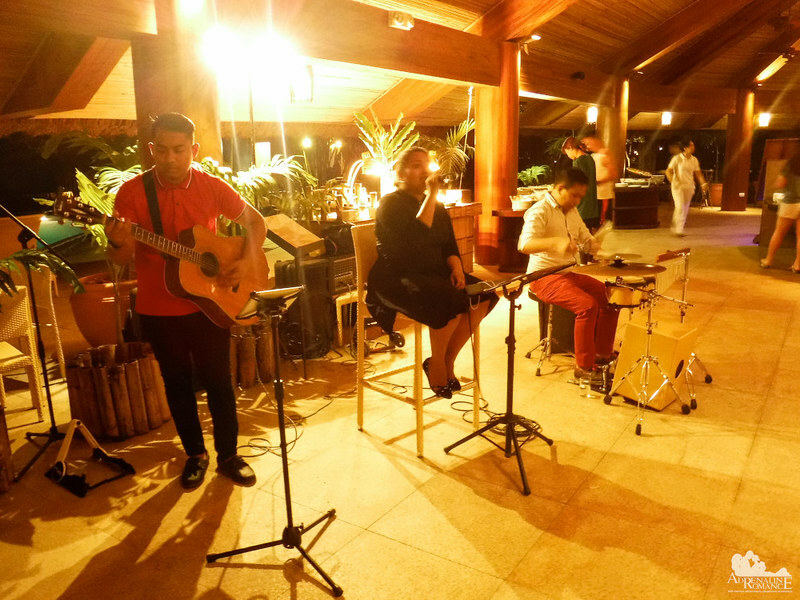 While you enjoy your seafood meal, skilled local Boholano musicians serenade you and other diners with folk and pop songs. 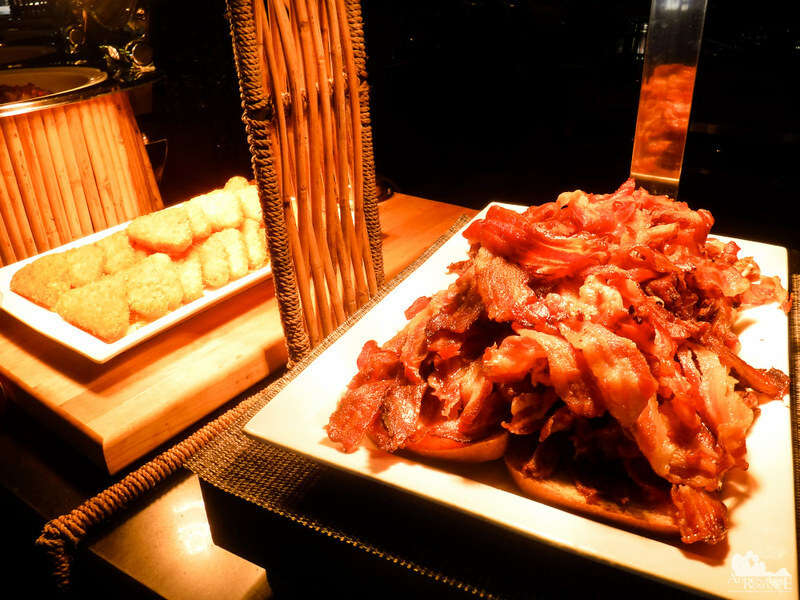 The Barrio Fiesta buffet is a must, especially for foreigners. You see, Filipino dishes—from the simple to the elaborate—are prepared with dedication, vigor, passion, and often, lots of smiles. Recipes, each with its own unique variety and imbued with different ingredients and cooking techniques, are handed down from one generation to another. Each morsel of deliciously prepared local dish gives you an insight of our country’s rich history and culture. 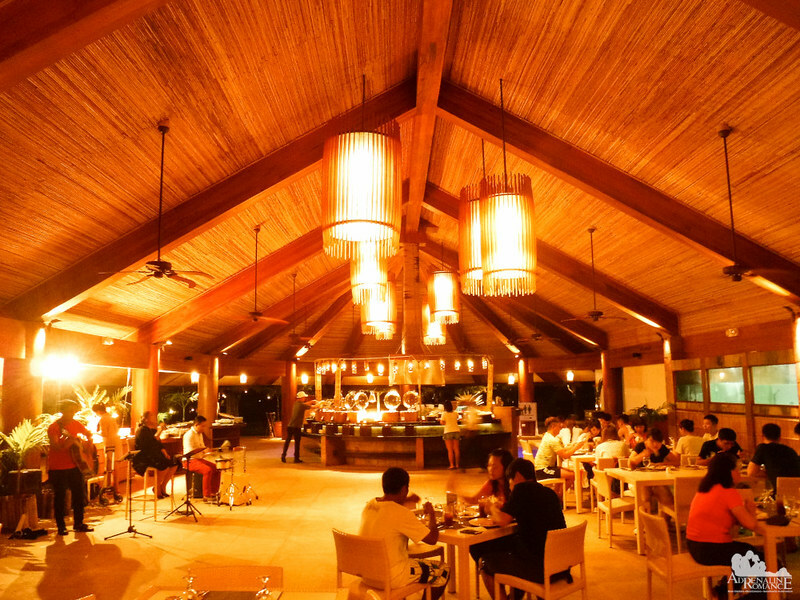 The open-air nipa-and-bamboo restaurant is reminiscent of a typical Filipino fiesta celebration. 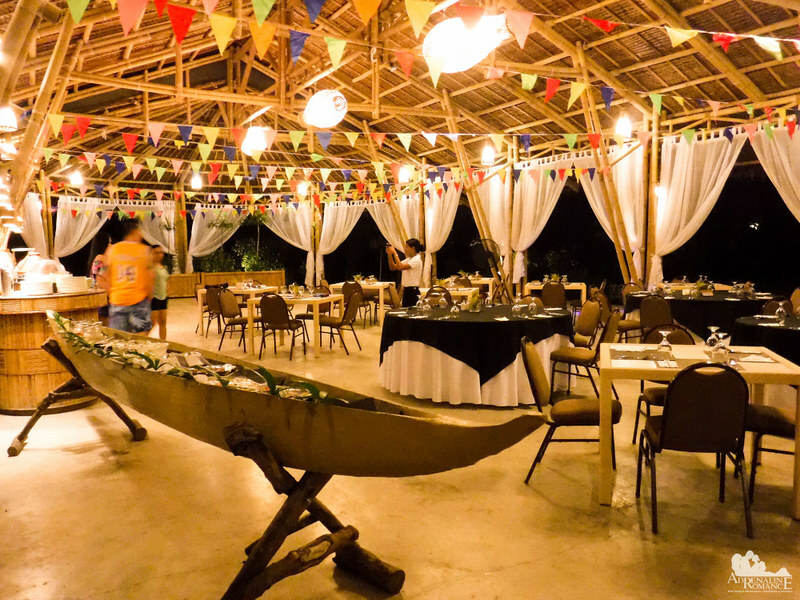 Colorful flaglets hang on the rafters while the hull of an old banca served as a display for various appetizers. Let’s check out what the banca brought us. There are appetizers such as itlog maalat (salted eggs), cucumber and carrot slices, tokwa’t baboy (chunks of tofu and fried pork doused in vinegar, soy sauce, and spices), fresh lumpia, and more. What a great start to enjoy an all-Filipino dinner! 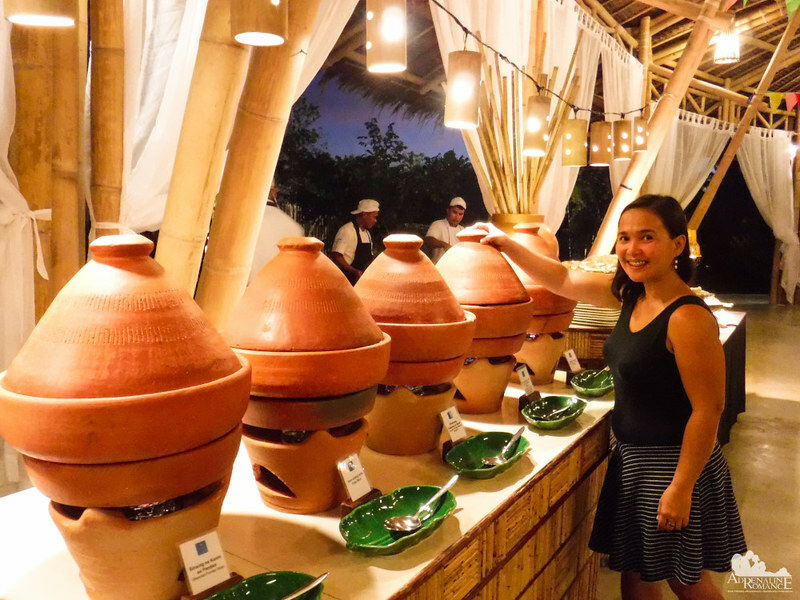 Various Filipino soups, stews, and other dishes are carefully placed in these earthen cooking pots. Locally known as kolon, the earthen pot is made of clay mixed with a bit of water and rice husk. Potters skillfully form the kolon using their hands. 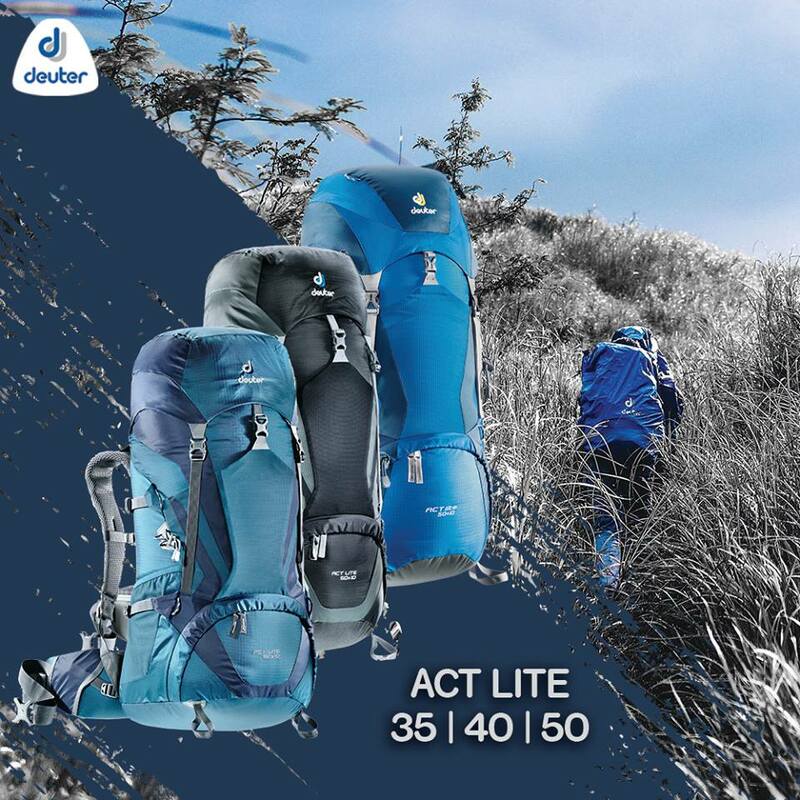 The cover of the kolon keeps bugs off the food, but it has a more important role in the past. You see, long before guns were invented, stealthy assassins sometimes slip lethal poisons in their victims’ (usually tribal leaders, shamans, rival tribe members. Later, businessmen or powerful politicians were targeted) meals. The extremely heavy cover, therefore, helps prevent these hitmen from putting those substances inside the vessel. 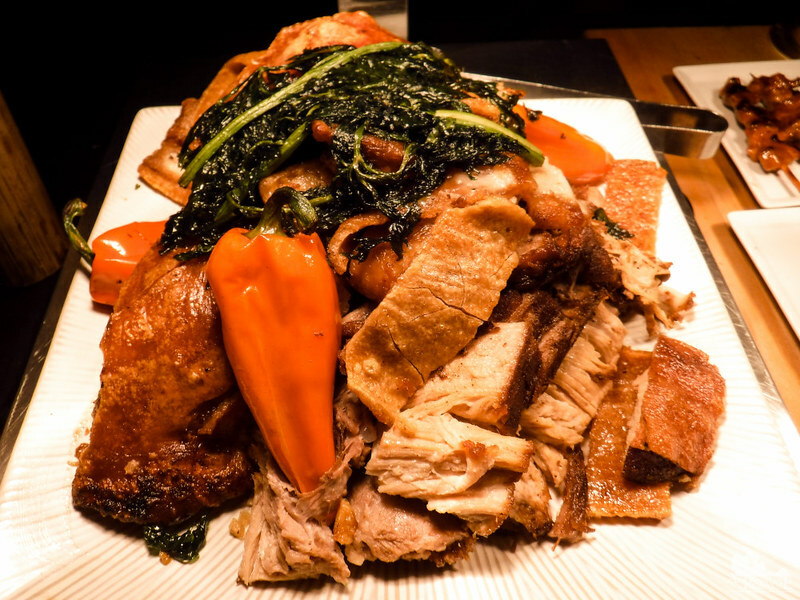 The star of this night’s Barrio Fiesta is a large serving of lechon kawali. A popular party and fiesta dish, it is made up of pre-softened, pre-seasoned pork belly that is deep-fried in a kawali (a kind of wok). The belly is then chopped into bite-sized, crispy pieces. Usually, it is served with a traditional sauce such as liver paste or toyomansi (a sauce made of blended native vinegar, soy sauce, kalamansi, and chili). This variant has a tinge of spiciness to it. Most probably, peppers have been added during the seasoning stage. 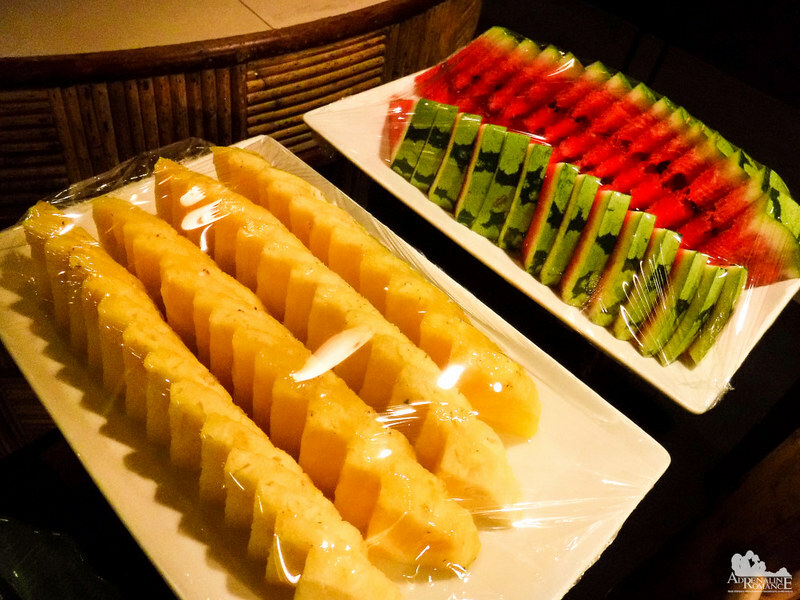 If you feel that your Filipino meal is too heavy on your tummy, you can wash them down with slices of tropical fruits such as watermelons and pineapples. 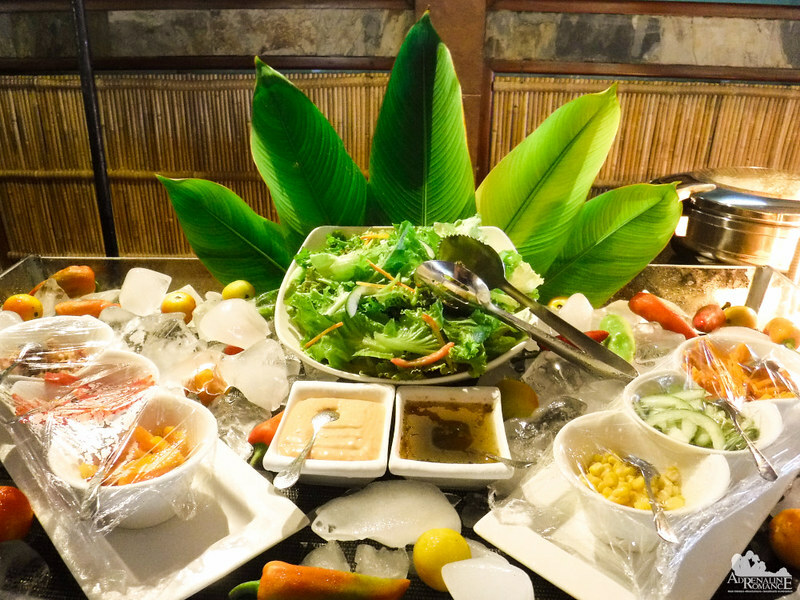 While you are having an excellent Filipino dinner, you will be able to appreciate our culture even more. That’s because while you’re eating, professional dancers from the prestigious Lumad Panglaoanon Cultural Troupe perform traditional Filipino folk dances that are revered all over the country. Each performance invokes a proud, nostalgic story about our culture that left our hearts swelling with pride. Many of the dances required an unusually high degree of skill and dexterity. 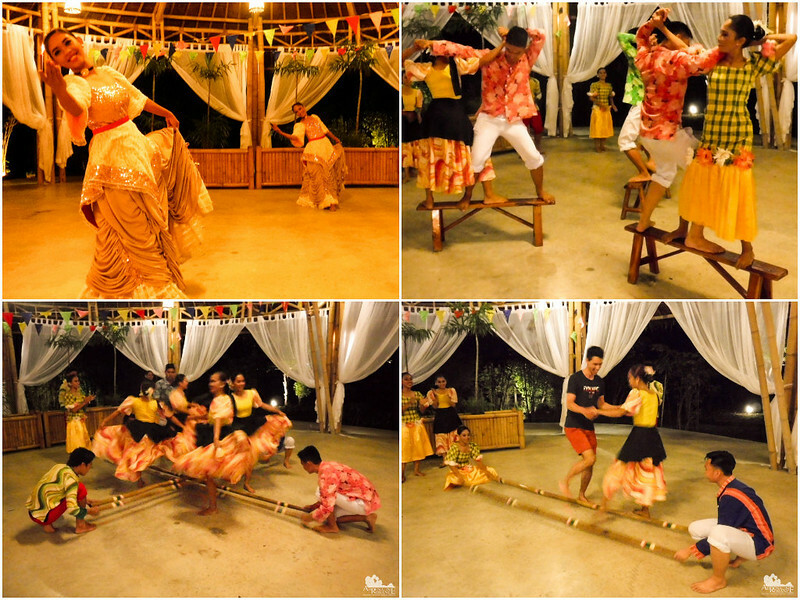 Tinikling, Sayaw sa Bangko, Pandanggo sa Ilaw, Maglalatik—the energy, balance, speed, and grace of these performances had us gripping our seats in breathless anticipation. In fact, many of our fellow diners who were foreigners were so visibly impressed that they stopped eating altogether so they can focus on the cultural troupe’s performances. During a break, several Lumad dancers may invite you to try out a dance. That is totally fun! 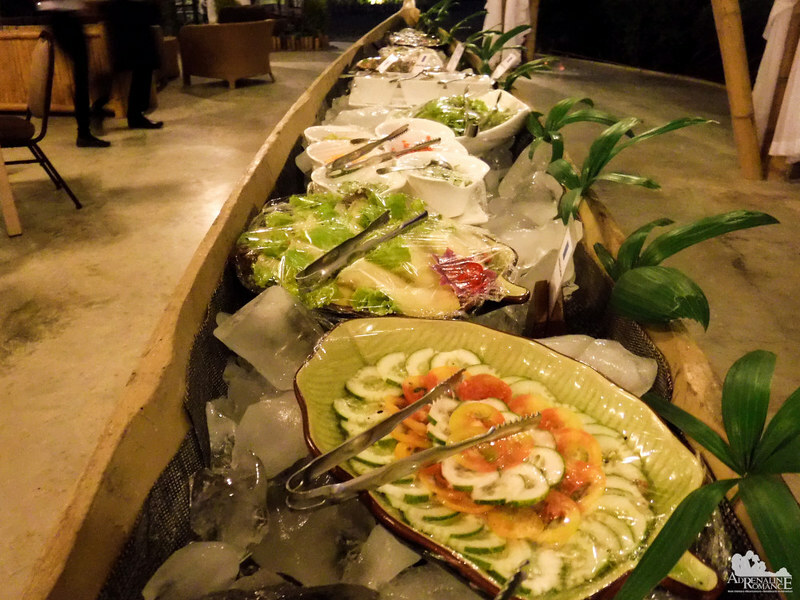 Like many other restaurants, Bluewater Panglao Beach Resort serves the first meal of the day in buffet style. It makes perfect sense; you need to eat a whole lot during breakfast, considering it is the most important meal of the day. Sweetie and I actually went back to the breakfast buffet around 4 to 5 times per morning of our stay! 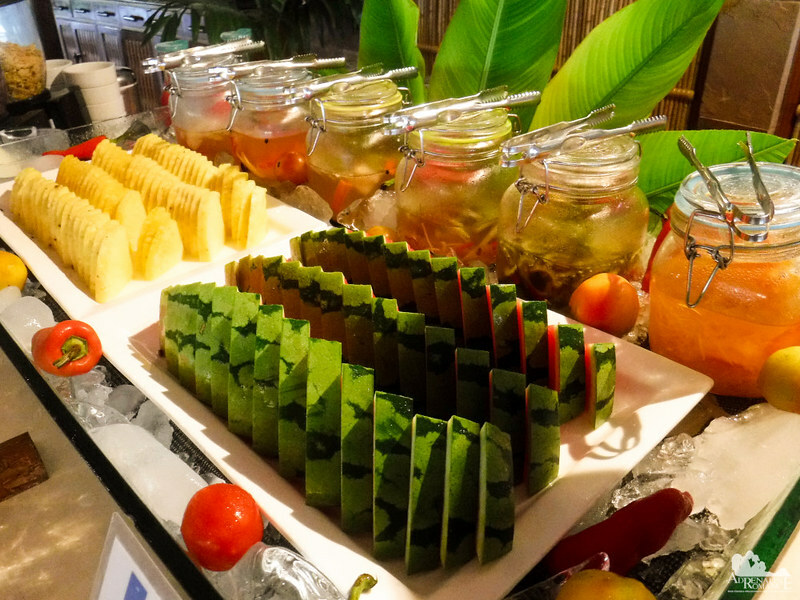 An eclectic mix of Western and Filipino breakfast dishes are available for selection. We helped ourselves with plenty of strips of bacon, hash browns, and eggs since we already consume Filipino breakfast food at home almost every day. 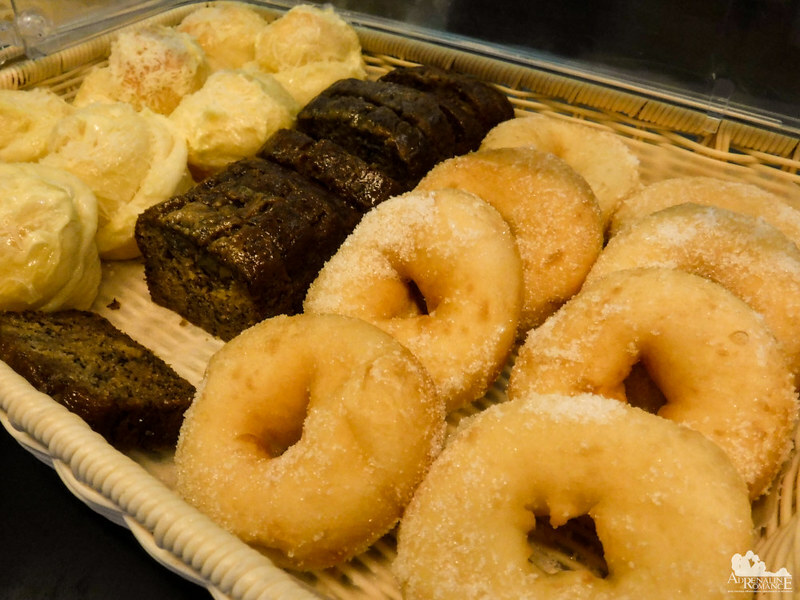 For those who want something light, there are a variety of Western and Filipino pastries. 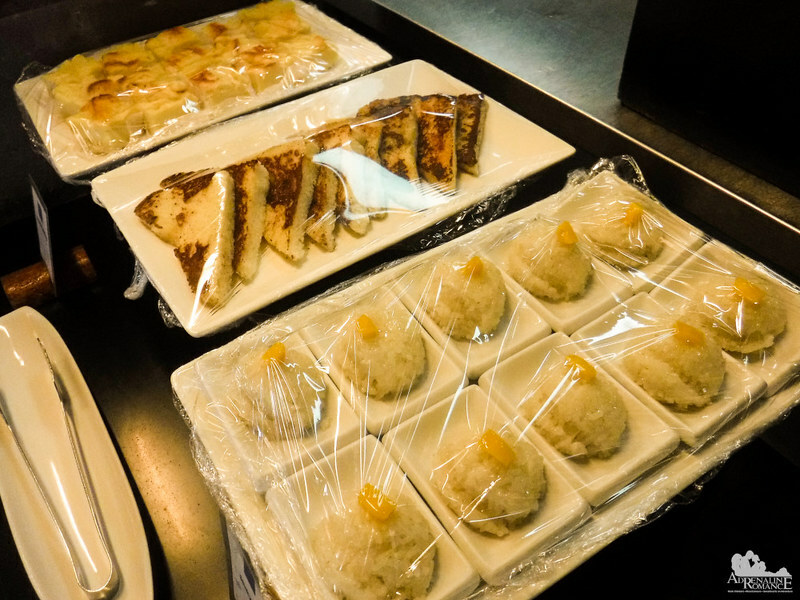 There’s maja (a jello-like dessert made of coconut milk, agar, and cornstarch and garnished with crushed peanuts), American pancakes, and puto maya (sticky globes of glutinous rice, coconut milk, and sugar. 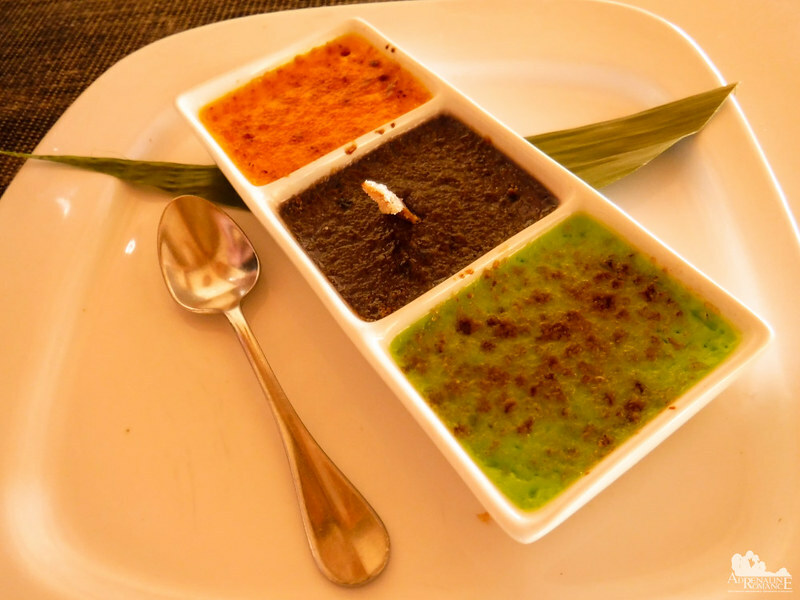 This dessert/appetizer is best paired with tablea, the Filipino version of hot chocolate). Here’s a display of Spanish ensaimada (bread topped with melted butter and sprinkled with sugar and grated cheese), chunky fruit cakes, and Filipino-style donuts (donuts deep fried in oil and sprinkled with refined sugar). Perhaps you are a vegetarian? Perhaps you want a breakfast that is rich in fiber? No worries! They have a salad bar with a myriad of fresh ingredients! Pickled and fresh fruits are for satisfying your cravings for sweets in a pleasant, healthy way. A buffet setting may not be available at times. Or you may want a dish that is not in the buffet table. Don’t worry because Apalaya Restaurant also serves à la carte meals. They have a great selection of Western, Filipino, and Asian fusion dishes and beverages. Sweetie and I celebrated our extremely enjoyable stay in Bluewater Panglao Beach Resort by ordering this triple crème brûlée for our last dessert. Mmmmmm! We could still feel the creamy custard melting on our tongue and the caramelized sugar crunching every time we move our teeth inside our mouth. We would like to give our heartfelt gratitude to Bluewater Panglao Beach Resort’s management and staff for this amazing stay. Special thanks to Bluewater Resorts Sales and Marketing Manager Erik Monsanto, New Media Officer Clarissa Joy Vasquez, and Marcomm Associate Ivy Palonpon for the invitation and opportunity. 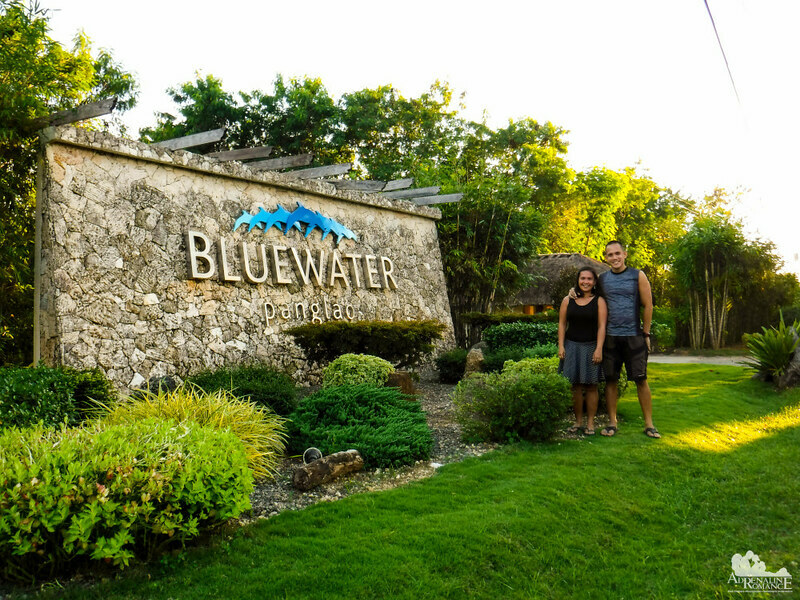 Our weekend in Bluewater Panglao Beach Resort was one of the best staycations we had in our lives. It is a resort that perfectly exemplifies not just the elegance of the Philippines but also the legendary warmth of the Filipinos. So come and visit them today! Oh, yes! And the food….you can’t imagine just how delicious it is! Mmmmmm! 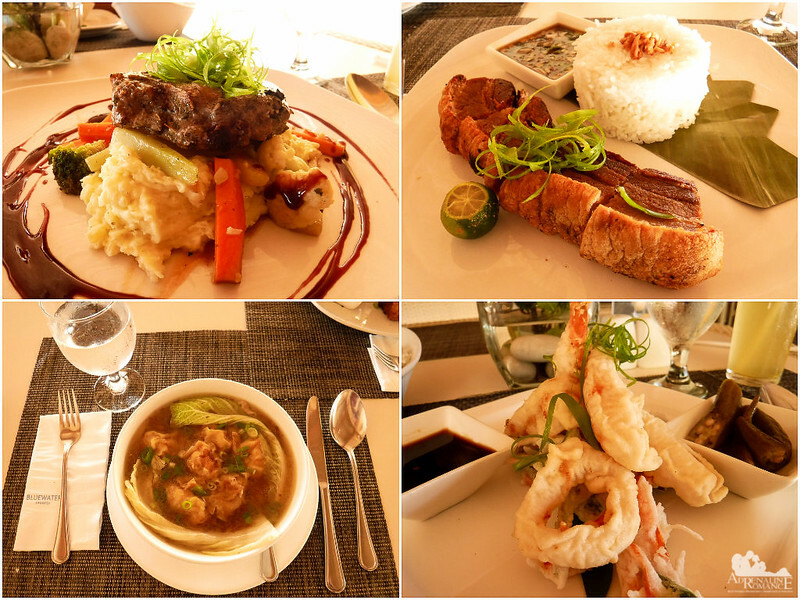 I can’t say I’ve ever tried Filipino food, but the sea food looks to be out of this world. If it’s going to be the next big thing, I will keep my eyes open for restaurants popping up in London… Or I could always take a trip to the Philippines. That looks amazing dinner and the dances, they are wow!! Wow, just wow. You basically listed all my favourite foods! Certainly I would live on fresh oysters and great to hear the qualities they exude. That being said, it’s necessary to get them at a reputable place otherwise, you are in for a distinctly UN-sexual evening! Indeed! 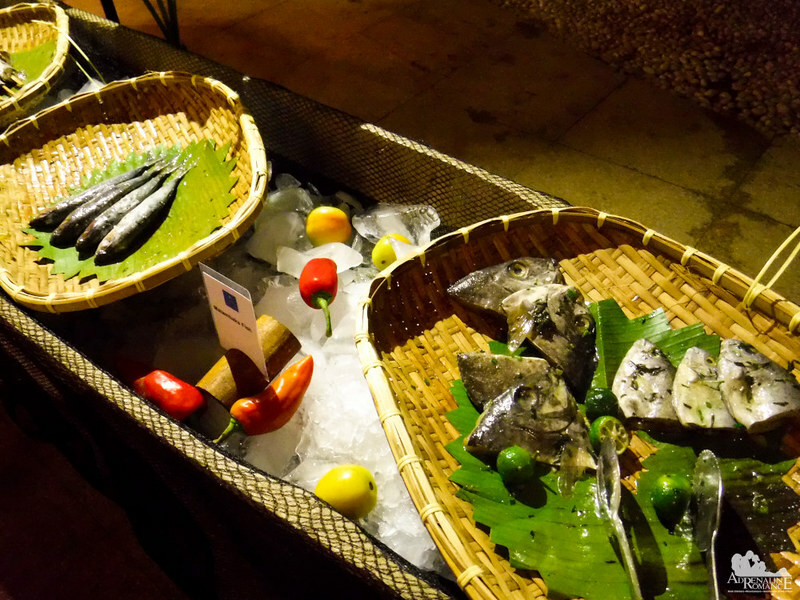 We love seafood, and Filipino cuisine is rich in seafood. This looks amazing! I love trying new foods, but haven’t yet tried a Filippino dish 🙂 Looks great! I would love to explore all these foods… looks so delicious! And spicy 🙂 It is also always fun to see how the culture seen in preparing the dishes or serving them. I hope I get to try some authentic Filippino food in the country some day. I love discovering countries with their gastronomy. I’m quite hungry for their cuisine now! Thanks a lot for this very tasty insight! Same here! I think a food adventure—sampling authentic and local dishes—should always be included every trip. Food is a huge part of a region’s culture. I love the ambiance of this place. It is warm and lively. Besides the food, I love the fact that you can experience a bit of the Filipino culture. Not just passively but by participating in it. Nice find!